In a comfortable kitchen set you will be able to observe how the expert hostess prepares three types of this delicious dessert. Hands-on participation is encouraged, so that you will able to make it again and again in your own kitchen! We begin with the demonstration and preparation of sponge cake and basic cream giving all the information concerning the main ingredients. 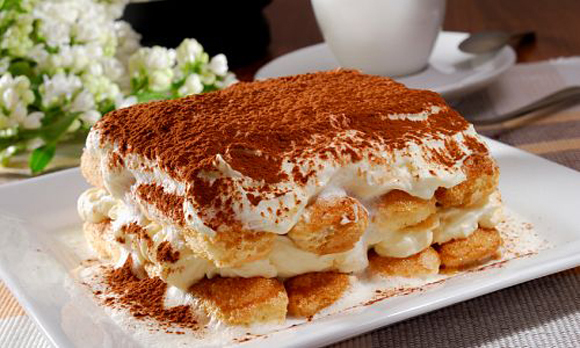 The pastry-chef will show you some versions of basic cream (coffee, coconut and chocolate) according to the type of tiramisu we wish to prepare. She will start preparing different types of coffee (Moka, Espresso and American coffee) and introduce you to its specific qualities. Soon afterwards 3 versions of tiramisu will be made. Finally, you can taste such a fresh, delicious and incomparable dessert as you enjoy tea, coffee or cappuccino. At the end of the class you will get complete recipes so you can try and prepare your own tiramisú at home. The lesson is held for a small group and it is a really fun and delicious experience! Class cost: €55 , per person.